Is fixed-hour prayer an odd practice for an evangelical Christian? I’m not sure—but I have found that at times using a Book of Hours has greatly enriched my spiritual life. Let me explain. A Book of Hours is a devotional book that became popular in the middle ages in which Scripture, prayers, and readings were collected so that Christians could turn their attention toward God and the spiritual life at appointed hours during the day. In some sense it is similar to the many popular books of today that blend writings of a favorite author with Scripture to form daily devotional readings. But the Book of Hours didn’t have just one reading for the day it had readings for different times throughout the day. “Fixed-hour prayer” is the ancient practice of stopping at certain times (as the name suggests) in order to read and to pray. (This practice is also referred to as “The liturgy of the Hours,” “saying the offices,” and “keeping the hours.”) This Christian tradition developed from the even more ancient Jewish tradition of reciting prayers at certain times throughout the day. The Bible contains evidence that the apostles practiced this Jewish custom. For instance, we are told in Acts 3:1 that Peter and John went to the temple at the time of the afternoon prayer. By medieval times the number of daily prayers had settled at about seven or eight. More recently the number has been reduced and many observe a morning office (that’s what the collection of prayers and scriptures is called), a mid-day office, an evening office (called vespers), and an office to be observed just before going to bed. There have been seasons in my life when the disciplined nature of fixed-hour prayer has been very meaningful. My days are often full of too many things to do and I get harried and scattered. A morning quiet time is great, but having numerous times during the day when I am called to recognize God’s presence and worship him is even better. It helps me to be more continually aware of God’s presence. Since this is the first week of Lent I decided to practice fixed-hour prayer from now through Easter. The set of books that I use in my own personal devotions is titled The Divine Hours: A Manual for Prayer and is a three-volume set. There is a volume for Springtime (the one I’m in now), Summertime, and Autumn & Wintertime. Each volume is sold separately. 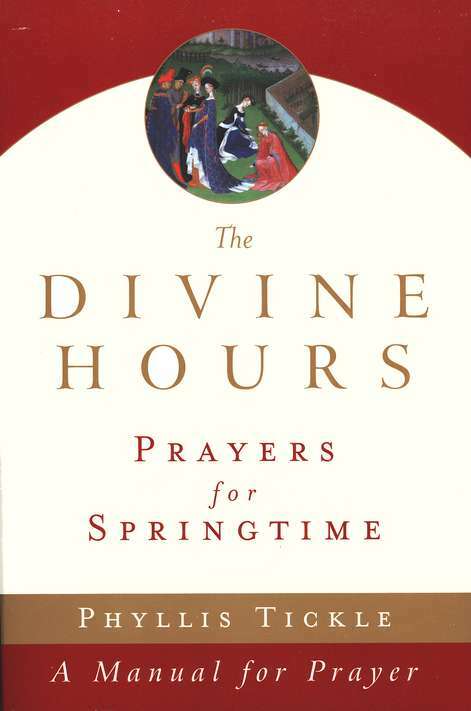 Phyllis Tickle, the author of The Divine Hours, did a major reworking of the sixth-century Benedictine Rule of fixed-hour prayer. She blended together scriptures, psalms, and prayers (mostly from the Book of Common Prayer) to create a personal liturgy that guides the reader into rich private worship. I know that the word “liturgy” can set some people’s teeth on edge. But really the bulk of the readings are straight from Scripture. Tickle has used the New Jerusalem translation for the Scriptures. One of the important revisions was that the prayers were translated from the first person plural, which would be used in public worship, to the more intimate first person singular of personal private worship. So, instead of confessing that we have sinned I confess that I have sinned. Instead of praying for God to guide us I pray that God will guide me. Each volume contains an introduction where Tickle traces the history of fixed-hour prayer from the apostles, to the church fathers, through the Middle Ages, to us today. In addition there are notes on how to use the manual. If you are interested in seeing what this manual of prayer is like Amazon allows you to look inside the book. One disappointing change in the newest edition is that it has been issued as a paperback. Of course, paperbacks are much less expensive than hardcover books—but they don’t hold up nearly as well; and for me a book that is going to be used several times every day ought to hold up. The hardcover editions can be purchased on the secondary market but the prices of each volume vary widely. The volume that contains Lent and Easter and the volume that contains Advent and Christmas are understandably more popular and therefore more expensive than the volume for summertime. Because keeping the hours is more popular during the seasons of Advent and Lent (hey, I’m doing it!) an edition of readings for each has been produced: Christmastide: Prayers for Advent Through Epiphany from The Divine Hours and Eastertide: Prayers for Lent Through Easter from The Divine Hours. Fixed-hour prayer isn’t for everybody—and I don’t practice it all the time. But if you are searching for a way to become more consistently aware of God’s place in your life this ancient practice would be worth trying. This entry was posted in Christian book, Devotional and tagged Advent readings, ancient spiritual practice, Book of Hours, Christian disciplines, Christmas readings, devotional readings, Easter readings, fixed-hour prayer, How do I grow spiritually, Lenten readings, manual for prayer, Phyllis Tickle, private liturgy, private worship, spiritual maturity, The Divine Hours, the liturgy of the hours. Bookmark the permalink.